Do you read comics all the time and have insights you want to share and discuss with a group? Are you a critical thinker, and curious about the genre of comics? 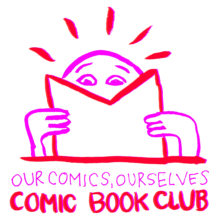 Join the Our Comics, Ourselves Comic Book Club! Each month we’ll select one or two comics or graphic novels to read, and then come together for an exploratory, critical, and spirited discussion at Interference Archive. This comic book club developed out of Our Comics, Ourselves: Identity, Expression & Representation in Comic Art, an independent traveling exhibition that originated at Interference Archive in 2016. The exhibition and the book club were created as an open space for discussion about identity-focused comics and the spectrum of topics they address. Some topics we hope to explore include race, class, gender and sexual identity, immigration, the role of authorship, character representation, and a lot more. One copy of each book will be on reserve at Interference Archive, and we will do our best to select comics that are available in our public libraries. Questions? Email us at info@interferencearchive.org. We want Interference Archive to be a welcoming and supportive space for everyone. Because we actively engage with political, social, and cultural movements—both past and present—and provide a space for lively, critical, and healing dialogue, we cannot tolerate harassing behavior or language. Thank you so much for treating each other with respect and kindness. Thanks for your message! Feel free to send us an email to info[at]interferencearchive[dot]org — it’s easier for us to reply that way.